According to the profile page on her website, Libby Schrum was born in Pennsylvania, she grew up in Atlanta, attended high school in Fort Worth, and went to college at Southwestern University in Georgetown, Texas. We found her in Maine, where she makes furniture and teaches woodworking, among other things. Libby was barely done with her undergraduate degree in sports management when she realized that she had no passion for it. In the end, she came to woodworking via post graduate studies in art and design. As a professional woodworker, she has built cabinetry for yachts, run a successful studio and shop, and taught at the Center for Furniture Craftsmanship and Anderson Ranch. Her work has been published in Fine Woodworking magazine and the New York Times and in 2010 received the prestigious John D. Mineck Furniture Fellowship from the Society of Arts and Crafts. 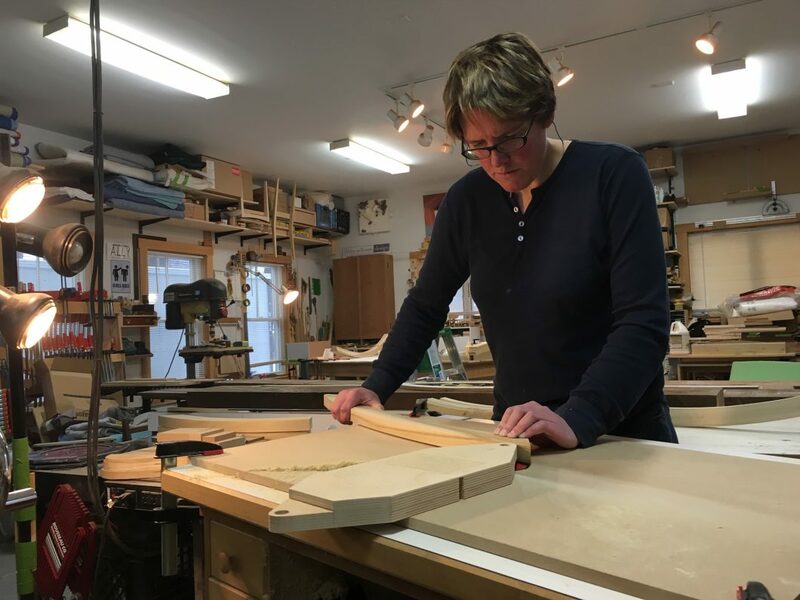 Her STUDIOcation program offers an opportunity for novice and experienced woodworkers to spend time designing and building a piece of furniture under her tutelage and in her shop. We recently exchanged emails with Libby to learn more about the life of a professional woodworker. BP: How did you first get interested in wood working? LS: My first experience in woodworking came from selling Girls Scout cookies, when I met Mr. Wood (yes, that was his real name). He was a retired computer engineer who had a small woodshop in his basement. It wasn’t anything fancy but we made things like wooden guns and toy guitars. When he passed away, I was just getting into woodworking as a serious endeavor and his wife gave me his Craftsman tool box, its contents, and a few other random tools. I still have it and use some of the tools I discovered inside. Mr. Wood was one of my two closest friends growing up in Atlanta. Skip forward some 10 years or so and that’s where I really became engaged in the art and craft of woodworking. My undergraduate degree is in sports management but thanks to fortunate circumstances, I was able to go back to school, post-graduation, to take a year of art classes. I had begun college as an art major but I was also an athlete and my 18-year-old brain wasn’t interested in sitting in art studio while everyone on the team was out at practice. The summer following graduation, I was frustrated. I had been applying for jobs in admissions and development in higher education (you could call it the family business) and at some point, my mom asked the question, “If you could do anything, what would it be?” Without thinking, I said out, “Something with art.” And so it began. During the first semester of art classes, I took an Intro to Design class. One of our assignments was to design and build a model of a piece of furniture. I designed a bed, built the model out of wood, and imagined how cool would it be to build an actual bed. That was the first time I had given any thought to the fact that people design and build furniture, as well as everything else in the material world. The following semester, I designed and built my first piece—a coffee table. It was a collaborative effort. My advisors on this adventure were a ceramics professor who knew a lot about form but nothing about furniture making and a cabinetmaker turned religion professor who taught us both about mortises and tenons. I was hooked. I packed my bags and headed for the coast of Maine where I enrolled in the Twelve Week Intensive at the Center for Furniture Craftsmanship (CFC). BP: You have as much, or more, training in design as you do in woodworking. What particular education or training has been the most helpful to you as a professional woodworker? LS: For me, the two go hand in hand. I could be the most skilled woodworker but I would not be fulfilled as a maker if I could not translate my own ideas into the pieces I build. As a designer, I feel it is equally important to have the experience of knowing the materials and how they can best used to reach the design goal. I think you can be a natural at either, or both, if you’re lucky. Much of what I have learned about how to make furniture came from that first three months at CFC. I also have an MFA from Rhode Island School of Design (RISD). RISD opened up my head to new styles and ways of thinking. I was pretty resistant my first year and the experience of art school was definitely more than I had bargained for. But it forced me to figure out what was most important to me and I found a place where I could be who I was, as a maker and a person. I live close by so in addition to teaching some at CFC, classes often stop in for a “shop tour” and Q&A at my place. When anyone asks the question, “What do you think about grad school versus the 9 Month Comprehensive?” I ask people what they want to learn or come away with from the experience. 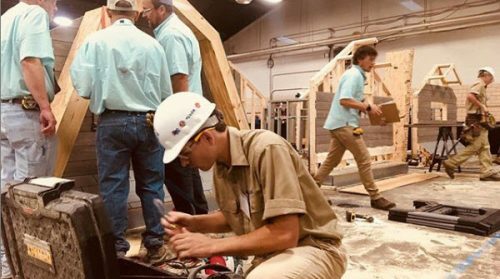 If you want to know how to make things and get a realistic idea of the business of being a professional furniture maker while also getting a bit of design training, a woodworking course like the 9-month program at CFC is the way to go. 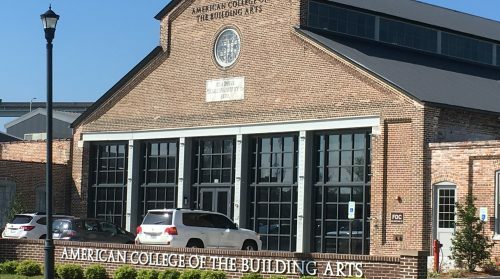 But if the exploration of concepts and materials, with the goal of breaking into the design world on a larger scale or teaching is most important, then grad school might be the best option. Knowing where you’ve been, what you know, and what you’re seeking to add to your bag of tricks is the only way to answer that question. Every person is different. BP: When did you decide to try to make you living as a professional wood worker? LS: Once, I had been to wood school, grad school, and spent a year in a fellowship program, I realized I needed to start making some money. I got a job as a cabinetmaker at a boatbuilding company that made world class power yachts and sailboats. I am not a boat person, but the work was challenging and I learned a lot about making use of what you’ve got to work with. The woodshop was not as new or high end as some of the shops I had been exposed to, but the finished product was unbelievable and I learned a lot on the job. Eventually, the boatyard was downsizing and I was ready to focus on building my own work. I was fortunate to win a large grant around the same time, which was a terrific boost to my plans to strike out on my own. Since then I have had good years, a great one here and there, and a couple that weren’t so great. That’s the nature of the business. Choosing to make a living in a creative field takes commitment. Both personally and from those who love and believe in you. I have not found woodworking to be a lucrative career but it is extremely fulfilling to be able to step back and realize that with my hands and my ideas, I’ve made something beautiful—objects people can use and interact with and that say as much about me as they do about the world we live in. BP: You don’t just build commissioned work. You also write and teach. How did these things come about and how do they fit into your career? LS: I love to teach people how to do something they’ve never done before, whether that is in a class setting or through writing an article. I am a detail person. To me the details matter, and if you can teach someone to see and think about details and to understand why they are important, that is incredibly rewarding. I often teach beginners and that first day, they are usually learning to sharpen chisels. 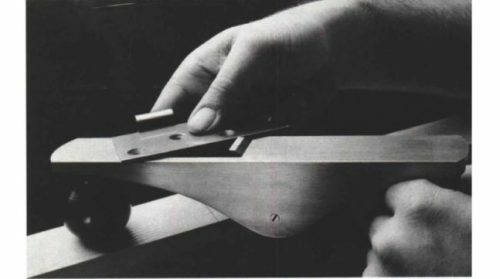 As silly as it sounds, if you can learn to look at your chisel and see why it’s not yet sharp and then understand how to make it so, then that same concept of analyzing and critical thinking can be applied during a lifetime of solving woodworking problems or anything else for that matter. I remember what it felt like to learn something brand new. As a student, I was quiet, shy, and never the one to raise my hand to ask a question. I just sat with all the questions that I didn’t even know I had swirling around in my head. As a teacher, I am always looking to connect with students and to draw out those unknown questions. Woodworkers in general are a very generous breed. Most are happy to engage in conversations about how and why we do things. I tend to think that there is really not much new under the sun when it comes to woodworking, just reinterpretations of the things that inspire us. I am always inspired and always learn something new every time I teach. BP: Woodworking is a field of mostly men. What has it been like to be a woman in a hands-on trade? LS: Honestly, my experience is probably similar a lot of women in a trade that is still mostly men. I am lucky to have been, for the most part, surrounded by people who get that women are just as capable, if not more so in some capacities, than men. That doesn’t mean I haven’t been hit on at the lumberyard or fallen prey to underlying misogyny from time to time. None of that defines who I am as a maker though. It’s just a reminder that I need to simultaneously keep my head down, let my work speak for itself, and hold my head up, confident that I know that I’m good at what I do. Change is an uncomfortable but necessary part of progress. A tough skin, sense of humor , and an interest in communication go a long way towards moving the needle. LS: Based on my teaching experiences and attending trade and home shows where I get the opportunity to talk to people about design and making furniture, I know that there are thousands of people who dream in furniture, just like I do. They can see the concept in their head and they if they only had the know-how, or machines, or space, they could build it. STUDIOcation is a learning experience based on this idea and tailor made for each person and project. Some people come for a week to build a piece they’ve designed but want help working through the whole process. A few people who are from the Midcoast Maine area come once a week, maybe a few weeks in a row. They might be stuck on a project they are working on and come to brainstorm and work through a solution. Others are new to design and spend a week hashing out a design that they can then go home to complete. STUDIOcation is also for people who know nothing about furniture but want to step into the creative shoes of a furniture maker for a few days and see what it’s like. They come to Maine on vacation (private onsite accommodations are included) and while they are here, build a piece of furniture. It’s better than any postcard you’d buy to remember the experience. STUDIOcation is a way I can share woodworking with more people, helping to create or strengthen the relationship between concept, material, and maker. BP: What has been a highlight of your career so far? LS: Highlights come in different shapes and sizes. Winning the Mineck Fellowship in 2010 was big one. But designing a piece like the Siblings bench that many people like and want to buy, but is also enjoyable and rewarding to make regardless of how many times I’ve made it, could also be considered a highlight. And, it’s always nice to be recognized for good work, especially good craftsmanship. 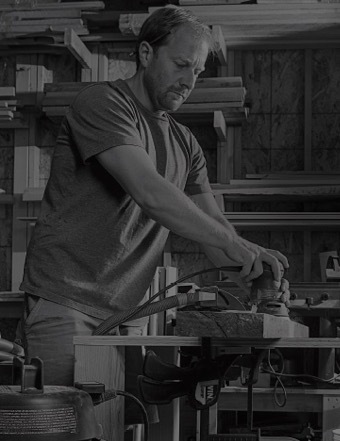 BP: What advice would you give to someone considering a career as a woodworker or an employed wood worker thinking of starting their own business? LS: Think about the business part first. If you are a creative person, the design and building will come much easier. Half of being a successful artist is knowing the business of being an artist. Even though half of my undergrad degree was in business, I had no intentions of owning my own business. I sure wish I had paid more attention! It’s hard, if not impossible, to look and feel good in all the hats you have to wear as a self-employed woodworker. And there are only so many hours in the day. You’ll figure out which parts you’re really good at and which parts you might need to bring in reinforcements for. Being honest with yourself is the most important piece of advice I’d give someone. The struggle is real, but often very rewarding.